I f ound that out early, at 6:30 when Jeta brought me a cup of instant cappuchino which we had bought in the supermarket in Kathmandu. (I long for a frappuchino from Starbucks, but realize ice is out of the picture until the end of this trip.) There was no hot water. So I sponged bathed and as is in all cases, brushed my teeth using mineral water from a bottle. It’s so hard not to automatically pass the brush under the sink water. After an apple pancake, we set out for today’s tough trek. 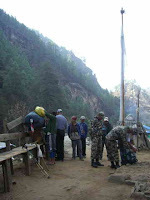 Departing Monjo, we passed through the entrance to the Sagarmatha Park, where we were required to get passes and were also stopped by the military bearing rifles for a bag inspection. Everything they had to view. They even got nervous about my prayer flags, not understanding that these were made by innocent children and not by some protest group with a purpose to upset China’s Olympics.. But they let them through in the end, as well as Jim’s satellite system, which is also suspect. 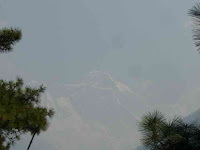 Nepal is enforcing China’s desire to prevent any kind of use of Mt. Everest for political purposes. 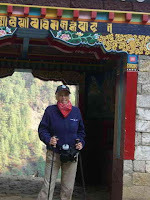 During the inspection, I walked through the brightly painted entrance gate which housed a dozen prayer wheels. So I turned the wheels and as I did, a troop of soldiers ran through in cadenc e. I wondered how anyone could run down those crude stone stairs. I am overwhelmed by the traffic of trekkers, hundreds of them with their porters carrying huge loads of bags. Many of the young sherpas wore black T-shirts bearing the face of Brittany Spears. Each time a string of them came through going the opposite direction, we had to move off the trail and balance until they passed. I envied them that they w ere done with heir treks and were on the way back to Yeti Airlines. But my task was still to come. 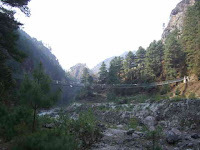 After about two hours - there are no tea houses or rest stops on the route to Namche Bazaar - we had crossed three long suspension bridges that wobble as you step on them while hanging over rowdy rivers and boulders below. Prayer flags are hung on all of them because that’s a good place to catch the wind to carry prayers to God. When we turned on yet another switchbac k out of the pines and rhododendron trees, and stepped into the clear morning sun, there before us was the first but hazy glimpse of Mt. Everest. It’s one tall monster of a mountain more than three times as high as we were at the moment (about 9500 feet.) Imagine that men and women climb to the top of t hat peak. Seems impossible. And maybe it is an invasion of what the Nepalis consider the property of God. There are so many deaths, not all of them made public. This year there are twice as many teams planning to attempt to summit Everest, but no one can do so until after May 10th, after the Olympic torch passes to the top on the China side. We took a breath to keep on climbing. It seemed never ending until turning another corner, spread across the side of a steep mountain was Namche Bazaar - it’s bright colored stone buildings, two or three stories high, braced against the soil and rock, each one stair-stepped above the other and stone walls encircling terraces of land for farming. I was full of pain by this time, my calves calling, my hip bones raw, my breath shortening by the minute. But by golly, we had made it in good time. To celebrate, Jim led us to a German bakery for tea and pastry called Herman Helmers Brackerie und Condetori. It was about one-fourth of the way to the top of the city where our lodge Panoramic stood. That’s about another 25 minutes of hiking straight up stairs. A rest would give us a boost. I requested a large cake donut that I had been seeing in bakery windows all along and felt good about eating it after the morning’s long skirmish. The bad news was we still had a ways to go, and the sun was hot, the wind cold, the dust flying. My Sherpa stayed with me as I slowly huffed and puffed up the crude stairs, dodging the porters passing me as if I was standing still - which at times I was - until we reached a white gate. This is it, he said. It was a good thing. I probably didn’t have enough umph for much higher. This is when the shortage of oxygen begins to set in. The red blood cells weaken, the bone marrow needs to get cracking to produce more, so we stop here to have time to re-adapt, the body being exhausted. 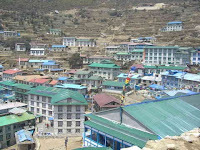 This is why we are staying in Namche Bazaar for three nights. Acclimatize. 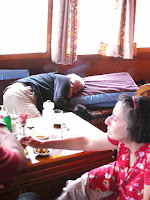 After a friendly welcome by the Sherpa lady who owns the inn and restaurant, we sat on the pillows on wall benches around the room and ate lunch. The cook who knew Jim well brought in every kind of Sherpa specialty - mostly the Dahl Bok which is a hefty meal of rice, bean and lentil soup, greens, potatoes and homemade pickles. A Sherpa friend of Jims who had been with Hillary’s son when he climbed in honor of his father’s fiftieth anniversary of reaching the sumnmit, came to join us. 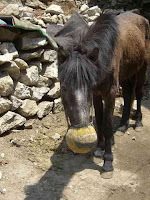 He will go with us the rest of the way and we will stay in his home in Panboche. Here I live in luxury - a room with a double sized bed, a modern toilet and a hot water shower. There is plenty of electricity here so we can recharge batteries and I can read Ken Follett’s Pillars of the Earth. This is sort of the routine, town to town. You go with what’s there. I had the additional experience after lunch to trip down many stairs to see the dentist. My old faithful tooth on a post fell out again, and a young and knowledgeable Nepali dentist, trained in Canadam who runs a local dental clinic, glued it back in for me. Then Jim took me to see a puja in progress in the house of one of his friends a few more steps downhill. Puja is a special blessing that happens once a year. It can last two or three days. We had to take off our shoes to enter, as had the monks - who appear to prefer Nikes. In a large room are elaborate tables, wall paintings and collections of holy books and a low altar of different kinds of yak butter candles, incense and silver urns all of which are thanksgiving and holy items. 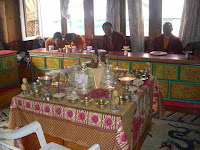 Six monks in red and yellow robes sat yoga-style at long tables and began to hum deeply when lunch was served to them. Most Buddhist houses have a designated sacred area or an elaborate room which the monks visit to cleanse, forgive and bless for the next year. It’s a time of horn blowing, text reading, chants and serious thought but the owners go about their business while it is going on, making sure the visitors are well-fed and attended. This must happen in every Buddhist home each year. Meanwhile, I could have used a blessing to get me back up the magnificent steps to my lodge. 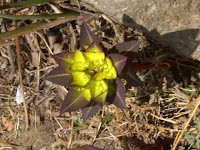 Photos: Entering Sagarmatha Park; Inspections by police; the suspension bridge number three; soccer balls are good horse feeders; a wild flower surprises; first view of hazy Mt. 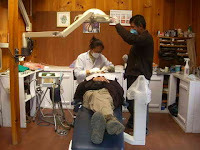 Everest; Namche Bazaar; the dentist visit' a "puga"; one worn out trekker.